Hemel Hempstead Lock & Key Centre are an established Locksmith company able to provide and fit a wide range of Digital Combination Locks, in an assortment of sizes and styles. Our Combination Door Locks are constructed to provide a simple and convenient security measure, designed to be used in accessible areas for a wide range of people, in both commercial and domestic properties. For more information please do not hesitate to contact us on 01442 359966. Our Combination door locks are extremely useful in places such as Offices, Store cupboards, Workshops, Flats and general communal areas. These Locks are generally operated by a digital push button code of between 4 and 10 digits, which can easily be changed at your discretion. 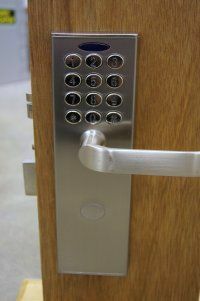 We also provide Digital Combination locks with a key override integrated into the turn knob as well as fully contained combination door locks operated by a lever handle on both sides of the door. Convenience and worry free Security- no keys or cards to be lost, stolen or copied. Totally self contained, requiring no additional extras. Burglar Proof Design-No keyhole means these locks are pick proof. Ideal for Families, Businesses, Elderly/disabled with carers. 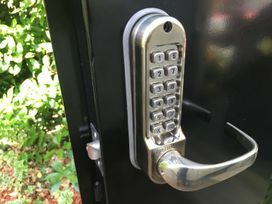 Depending on the style of Digital Combination lock you choose, many people find the Key-less locks the simplest and easiest lock to use because no keys, batteries or wires are required. They are easy to install and use, fit most doors and many are weather resistant. We stock a wide range of combination locks from Unican, Tate, Lockey, Yale, Simplex and securefast. What ever your security requirements please do not hesitate to contact us for more information or advice on 01442 359966.